Abstract: Acute necrotizing encephalopathy following influenza infection is a rapidly progressing disease with high morbidity. Although the neurological disorder is sometimes reported in children, it is very rare in adults. 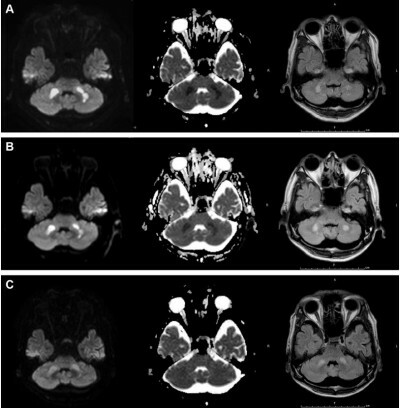 We herein describe an adult with acute necrotizing encephalopathy captured on a series of brain magnetic resonance images. A 55-year-old man had fever and impaired consciousness. He was diagnosed with influenza A (H1N1). Brain magnetic resonance imaging revealed symmetrical lesions in the cerebellum and basal nucleus, showing typical acute necrotizing encephalopathy. Physicians should know that influenza-associated acute necrotizing encephalopathy can occur even in middle-aged adults.